Robin Blakney-Carlson is a full time felt artist, teaching feltmaking to all levels of experience in her Luckystone Feltworks Studio, located in the historic Shirt Factory in Glens Falls, New York. 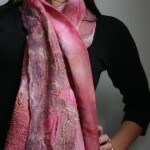 Luckystone regularly hosts internationally known feltmakers for special workshops and retreats. Robin began felting in the mid ’90s, under the tutelage of her sister, Polly Stirling, known to fiber artists for developing the technique she named nuno felt. 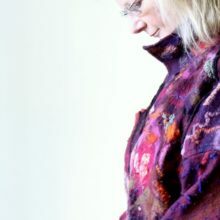 In addition to mentoring with Polly, Robin has studied with many master feltmakers including Chad Alice Hagen, Liz Clay, Inge Bauer, Jeanette Appleton, Marjolein Dallinga, Leiko Uchiyama, Karoliina Arvilommi, Myfanwy Stirling, Jorie Johnson, Martine Van Zuilen, Sylvia Watt and Sachiko Kotaka. Known for her use of color and a focus on technical proficiency in her work and classes, Robin specializes in creating wearables and art felt- combining traditions she loves: wet felting and stitching. Robin’s work has been represented in exhibitions and galleries in New York and New England. 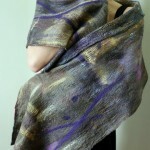 She has taught feltmaking throughout the US and Australia.